Have you ever had so many good options that you couldn’t make up your mind … and you ended up doing nothing? There is something to be said for doing something rather than nothing — but when we’re able to identify and select the best use of our time, we practice the art of time management at its finest. Have you heard of the 80/20 Rule? It’s also known as the Pareto Principle. It was discovered in 1896 by Vilfredo Federico Damaso Pareto. And so was born the Pareto Principle. It holds that roughly 80% of your results will come from only 20% of your efforts. It is important to discern what is merely good versus what is best. For instance, rather than eating that big ugly frog today, perhaps doing your best — that 20% that will produce the greatest results — means devouring a few lesser tasks to build confidence and momentum. How might your life be transformed if you identified and focused more energy on the 20% responsible for 80% of your productivity? Which of your activities belong to the 20%? Which 20% of your possessions do you use 80% of the time? Which 20% of your exercises account for 80% of your fitness? Which 20% of your foods account for 80% of your nutrition? Before you begin any task, ask yourself whether it belongs in the top 20% or the bottom 80%. If the answer is the 80%, eliminate it whenever possible. 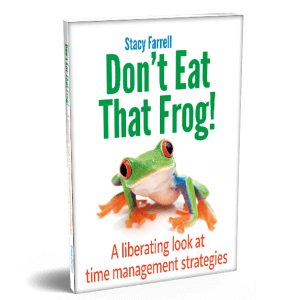 This is the Part 2 in a blog series based upon the book, Don't Eat That Frog! A Liberating Look at Time Management Strategies. If you missed the introduction, you can read it here.